The intersection of big data and marketing is reaching an apex. More brands, companies and agencies have more data than they know what to do with. And the drive to constantly collect more seems relentless! Once you have this data what are you doing with it besides sending charts and graphs to various internal departments to decipher without context or connection to strategic goals? Many brands are bringing IT/data and creative teams together to discuss what the data means for their audience and how they can mine it to inform user experience and interaction going forward. Until recently, the most obvious application of data to marketing is targeted advertising through digital platforms. But this data can be mined for so much more than clicks and website hits. It can provide insights into who is interacting with your brand, how and when they are doing the interaction, and guide you to create a user experience that meets your audience where they want. Bringing together interdisciplinary teams – IT and creative – lets you stop spinning your wheels on new statistical models or building better data visualizations. A design-thinking approach brings data scientists into the process as creative problem solvers. The collaboration of data scientists and designers allows them to learn each other’s art and produce better outcomes. Data is just raw material. By looking at the needs, habits and insights of the people interacting with the data, rather than leading with it, means design can reflect and respond to the functional, social, and emotional behavior of users. This combined approach enhances the user experience and can be a differentiator for your company. But how do you bring those internal teams together to create a user focused interaction? A great example of data scientists working with designers to create an effective user experience is Rise Science. Rise built a data platform for college and professional athletes to track their sleep and adjust their behavior so that they played at peak performance. Rise provided data-driven charts and graphs the players were expected to analyze, and then determine what decisions to make next. The players struggled with the analysis and finding the insights. Rise felt the solution was just easier to read charts and graphs. Rise’s data scientists and designers partnered together and met with their players and coaches. They discovered the issue wasn’t a data visualization problem but a user experience problem. The players didn’t find the charts and graphs helpful, they just wanted to know when to go to bed and when to get up. Engaging data scientists in all stages of the design thinking process pays off in incalculable ways. The collaboration produces powerful results that can transform data from a crude tool to measure your business into a sophisticated tool that helps your business grow. The intersection of data and creativity can also allow data-driven platforms the ability to serve high-quality, innovative content directly to an audience in unexpected ways. Think about Netflix. They use their stores of consumer data not to drive creative decisions about how to produce content, but to match audiences to content that meets their tastes. Their advantage doesn’t come from creating award-winning content, it comes from knowing exactly who the audience is as individuals and being able to serve the content directly to them. (2) They are taking the data and getting the right content into the right users’ hands. Part of Amazon’s success comes from their ability to match consumers with products based on data about past purchase histories that brick-and-mortar stores don’t have. Companies can tap into their data to focus on unique content that can be delivered directly to the best audience for the message instead of creating mass-market content to appeal to all consumers. More than a mobile responsive website and Google Ads, data can drive the creation and implementation of branded apps, touch screen kiosks at events, drip email messaging, and loyalty rewards programs that are reaching segmented audiences in ways they never expected, and putting your brand top of mind in each interaction. At Ballyhoo we take a research driven approach to all our projects. Having data insight helps us to better understand the intended audience and match the right message and medium to meet them. 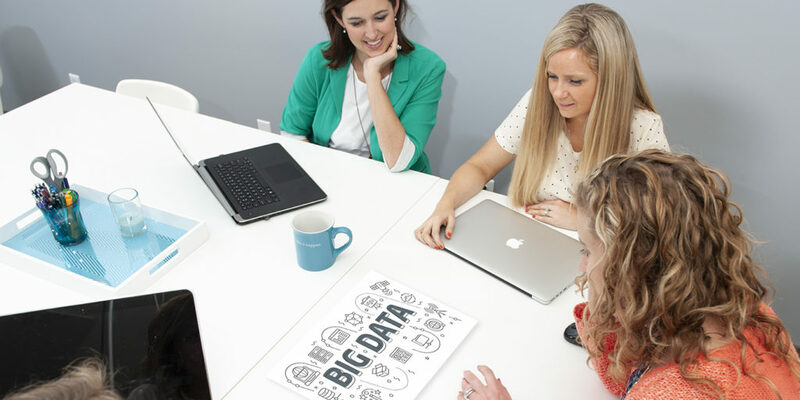 We work with our clients to help them understand their data and how it can drive their brand. Are you collecting data or are you using it? Let’s talk about it!